I made my way back to Rogue’s back on Sunday after a lengthy hiatus. I finished the back last night (though I have to redo one shoulder where I accidentally missed one of the wrap and turns, that should only take a few minutes). 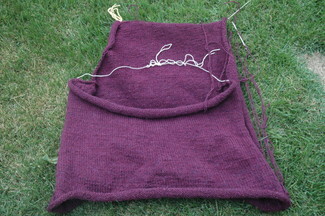 I hope to work on the front split tonight, which should be fun since it includes cabling again (and on the wrong side! ), not just stockinette with shaping. Then it’s onto the scary scary gorgeous hood. I did notice that my Rogue is really, really big. It’s wide and long. My stitch gauge is pretty much spot on amazingly — I just made one size bigger than I should have. My row gauge is off by ~.5 rows per inch. This means it is a few inches too long. Oops. Luckily I expected it to be a little big — since it is a comfortable, sweatshirt-styled sweater that I will wear while walking the dogs during the cool fall and winter. I think I may just be able to finish this one before November… unless I er, get distracted again. You’re killing me with all these beautiful colors!! I think I got red-ed out. That is a lovely color. Maybe you could felt it a little in the wash to shrink it up? Either way it looks like it’s going to be comfy! Good luck staying on task! It’s so hard with all the wonderful distractions out there!! Your Rogue is coming along so fine – and what a beautiful, soft and warm color you’re using! Looking forward to seeing the pics of it once it’s finished! Happy Knitting!